Early in 1995 the Montgomery City Council led by Jenny Stewart agreed to the concept of building a city park on a five-acre tract of land on the north side of HWY 105 across from the Montgomery Post Office. At the same time, City Council entered into a letter of intent aimed at securing the necessary land. The council also agreed to an application for matching funds from the Texas Department of Parks and Wildlife. The original grant was for $500,000 with 1/2 of the funding being provided by local contributions and then the State of Texas would match the funds up to the remaining one half. The Texas Department of Parks and Wildlife not only matched cash contributions but also in-kind services and donated materials. A Board of Directors was created consisting of ten members. They were A. F. Cleveland, Bob Peel, Jerry C. Durbin, Timothy McWashington, Jr., James Price, John Butler, Bessie Owen, Henry Burton, Anna Weisinger and Rebecca Simonton. Texas A & M University was contacted and under the direction of John Rodiek, 21 design students took on the park design project for their senior semester. Cedar Brake Park is nestled among century-old red cedar trees in the heart of Historic Montgomery. 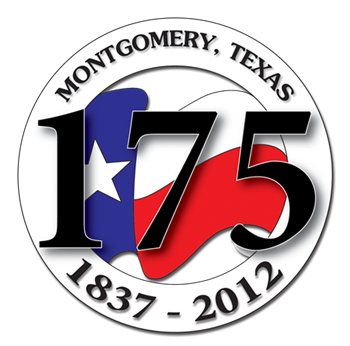 Since Montgomery was founded in 1837, children have played in this five-acre area. Anna Weisinger and Bessie Owen remember playing there as children and even then it was known as "Cedar Brake." Children today and those in the future will find this park very different. As they celebrate birthdays and other special events, they are able to play on the very best playground equipment available. Both play yards (2-5) and (5-12), donated by Bob and Shirley Peel, are handicap accessible and provide challenges for all abilities. The play equipment for the older children offers the wheelchair-bound child an opportunity to climb above ground level and traverse a movable bridge. Another fun activity for all ages is a twenty-foot tube covered with dirt in which they can crawl through or run over. The 40'X 60' pavilion was built by Ronnie Phillips of Jordan Construction and named for John Butler who was mayor at the time of the creation of Cedar Brake Park. The pavilion offers lighted shelter for individuals or a wonderful covered area for large gatherings. Each item within the park was either donated or provided at cost. Much of the backbreaking labor was done on "work days." Community members of all ages would meet at the park site and work on the project of the day. After several hours of hard work, the group would be treated to lunch at Ms. Anna's. These workdays began with the clearing of the brush-filled site and ended with the installation of the picnic tables. Ten picnic tables made from cedar taken from fallen trees in the park are scattered throughout the park. All existing tables have been donated by individuals or civic groups and are designated by plaques. Bar-b-que grills are also located near the tables. Boy Scout Troop 491 had three young men working on their Eagle Scout ranking. Andrew Sullivan built the footbridge that spans the swale on the north side of the park. Lance Ewing designed and built the small gazebo and John DeLoach built the picnic table cover on the corner of HWY 105 and Houston Street. The bird and butterfly garden attracts wildlife all year around. Two flag poles donated by James Price, flank the stone sign and greet all visitors traveling west through the city. A three-tiered decorative fountain is centered on the Hwy 105 side. Two five-light Victorian lamps adorn each corner and single light fixtures are scattered along a winding path joining all of the elements together. Memorial bricks line two areas of the sidewalk to create a "Path of Memories." The funds for the sidewalk were made available from the Montgomery Industrial Development Corporation. A beautiful sand-blasted redwood sign faces east and west on Hwy 105 so all who enter Historic Montgomery will know that there is a beautiful, comfortable, fun and accessible park for residents and visitors alike. Cedar Brake Park is an outstanding project that most communities would envy. The latest project of the patrons of Cedar Brake Park is the erection of a bronze sculpture by artist Lynn Peverill titled "The Pioneers of Montgomery." 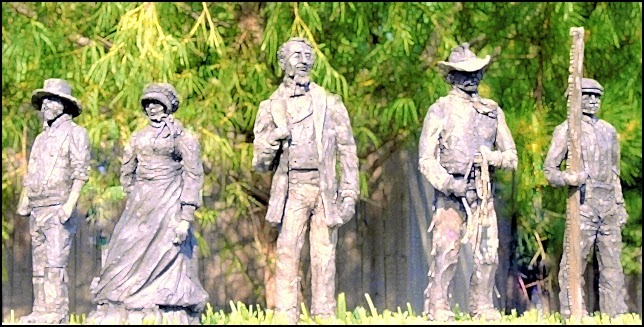 The historical monument will feature five life-sized historic figures from Montgomery's past including Texas founding father Charles B. Stewart, a farmer, a rancher, a logger, and a pioneer woman. Fundraising for this current project has already begun. For more information contact Sonya Clover at 713-899-0128. Special thanks to Sonya Clover for providing this article to the Patrons of Cedar Brake Park web site.